We’d love your help. Let us know what’s wrong with this preview of Love is... by Monica Dumont. This beautiful children's book imparts children with acceptance of self and others. Through the universal energy called LOVE children can learn about community, unity, inclusion of others and love for all living things around them. This book includes images of children from around the world as our global community is united through love. To ask other readers questions about Love is..., please sign up. 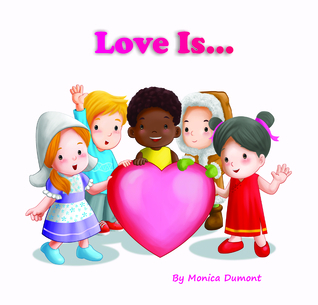 I've created "Love is..." because I want to show children that love is found everywhere we look. Through simple things such as when grandma makes us a sandwich or when we smile at others, love unites, love heals and love allows us to expand. Real love is not found in the material things we often show our children. but in the connections we make with ourselves and with others. Thank you Monica for my Goodreads Firstreads copy. I really enjoyed this book. It is very simple and sweet, and includes children from different races, cultures, religions, skin tones and also disabled children. I will donate my copy to a hospital, so that more children will be able to enjoy it. Celebrated for her children's personal development series, Monica Dumont is a Guatemalan-born Canadian award winning author and spiritual teacher whose work is credited with being inspirational and touching. She draws upon her childhood memories and the lives of the children around her to create stories that speak deeply to her young audience. Her expertise is in the field of personal growth. Accl Celebrated for her children's personal development series, Monica Dumont is a Guatemalan-born Canadian award winning author and spiritual teacher whose work is credited with being inspirational and touching. Acclamée pour sa série développement personnel des enfants, Monica Dumont est une canadienne d’origine Guatémaltèque, auteur primée et maître spirituel dont les écrits sont reconnus comme étant inspirants et touchants. Elle s’inspire de ses souvenirs d’enfance et des enfants qu’elle côtoie pour créer des histoires qui parlent profondément à son jeune public. Monica œuvre dans le domaine du développement personnel.